October is here, and it's going to be a busy month for me and my publishers. The new Wild Cards reissue, DOWN & DIRTY, comes out on October 27, as detailed below. But as it happens, that's not the only book I have coming out that day. October 27 is also the day Bantam will be releasing the new Ice & Fire Coloring Book. Yes, I said "coloring book." Not just for the kiddies either. No, it seems that of late adult coloring books have become quite the thing, so Bantam wanted us to do one too. And since I love seeing good fantasy art, I was of course thrilled by the idea. Anne Groell tells me there are also plans for a COLORING CONTEST down the line, with some cool prizes for the winners. No details yet, but I'll post them here when I've got them. I have seen the (uncolored) art for this one, and it looks spectacular. Probably will look even better once colored. So stock up on your colored pencils, boys and girls (or your crayons, if you dare), you're going to need them. I'll make sure to stock up on red and black colored pencils for the Jon Snow page! off course, as anyone, I love to heare any news from you about ASOIAF world, but what I loved most about your blog was read about your writing process, your struggles, your way to overcome this struggles. Jaime, Hoat, and the hand. Jon and Janos while Stannis the Mannis nods. Tywin, Tyrion, and the crossbow. George, I challenge you to color a page and post it! I'm going to Hobby Lobby right now to get colored pencils. When they call it "The Official A GAME OF THRONES Coloring Book," does that mean there are six more on the way, or that it's based on the show? It is not based on the show. I will get to that one, never fear. I got into Adult Colouring, or as it's sometimes called, Art Therapy, in March and I am really looking forward to receiving this book. If I really like the book, I can see myself getting a 2nd copy. I've even coloured some of my other pictures to resemble ASOIAF characters so this was great news for me. I'd post an example of my ASOIAF themed pics here but Livejournal doesn't appear to allow that, so never mind! I have been buying kids coloring books for years to get my fix till the recent adult coloring craze created some nice, actually artistic options. But this. Oh be still my heart! 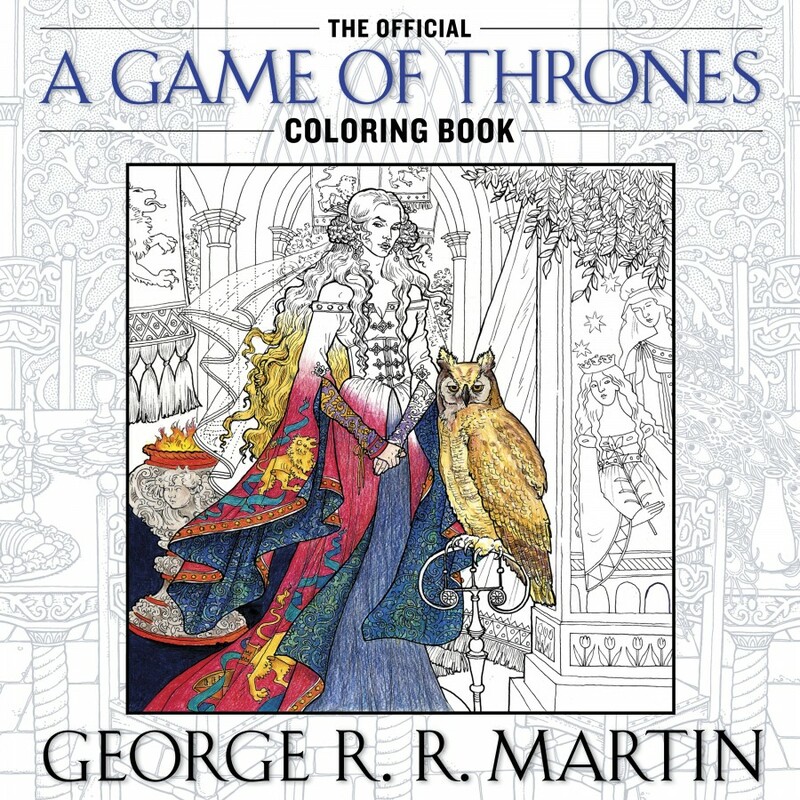 Coloring AND ASOIAF all in one?!? I'm hooked! Thank you, George and all others involved! You've made a happy Jan! "So stock up on colored pencils, boys and girls." You are going to need the red ones in particular. I'm going to need more red crayons. You mention this is an Ice & Fire coloring book and Cersei does not look that closely like Lena Headey. The the cover says it's the "A game of thrones" coloring book. With an "A", so am I right to assume the drawings are all based on the first book in the series? Great fun this! And am I completely mad to think the next thing might be an "ice and fire" Karaoke album? Would be great party stuff, singing along with "the bear and the maiden fair", "the Dornishman's wife" and "the Reynes of Castamere". Yes, this one derives from the books, not the show.